Address : Office loccated at the Mohair Experience Museum in Bridge Street, Jansenville. 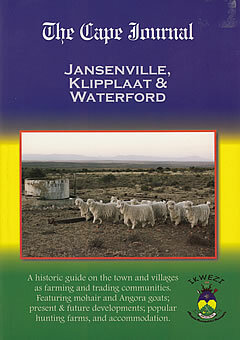 A Historic Guide on the town and villages as farming and trading communities. Featuring mohair and Angora goats; Present and future developments; Popular hunting farms, and accommodation. Some of the information on this website was extracted from this informative book. It contains a lot more detail, and can be ordered from the Sid Fourie Museum.